What's Linda Cooking - Page 4 of 4 - Your Solution to What's for Dinner Tonight!! I love chicken!!! I love the price. I love chicken’s versatility as an ingredient. I love the leftovers I can have with a whole roasted chicken. There are so many different meals I can make from one little (or big) roasted chicken. This week I purchased a whole chicken for about $.89/lb. It was reduced, so I needed to either cook it that day or throw it in the freezer. I decided to cook right away. Cooking quickly without heating up the kitchen was a must. Butterflied grilled chicken was the answer. It was fabulous and we ended up with leftover chicken breast. My family prefers roasted dark meat chicken. Needless to say, we had leftover chicken breast. Sauté the peppers and onions. 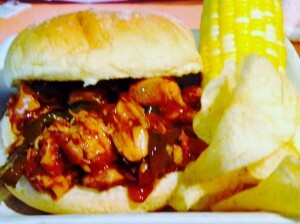 Add the chicken and barbeque sauce and combine. Once heated through divide the mixture among the buns. What do you make with leftover chicken? Please comment. I would love to hear your ideas! Mom, Why not make Beef Stroganoff? Have you ever had a plan for dinner and then someone in you house, asks for something else? That is exactly what happened to us today. I took out some ground beef with the idea of making a Beef and Ramen Noodle dish. This was a new dish I was going to try. Not one of my more adventurous eaters, my daughter asked for Spaghetti. 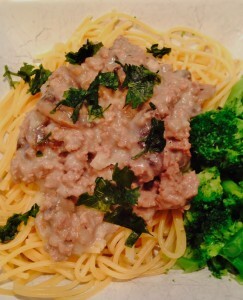 Not feeling like spaghetti and tomato sauce, I suggested Beef Stroganoff. She immediately agreed to that…it’s one of her favorites. But there was a problem. I have no sour cream in the house. Do I run out and buy some sour cream? Not make the stroganoff? Not really options I liked. I came up with an adaption to the recipe and made a very respectable, if not delicious version of Beef Stroganoff. Instead of using sour cream, I made a Béchamel Sauce and just added more milk to get that “creamy” type consistency. It was delicious!!! So, the next time you are missing an ingredient, instead of running out to buy said ingredient, try to adapt the recipe. You just may find a lighter version and a better version. How about you? 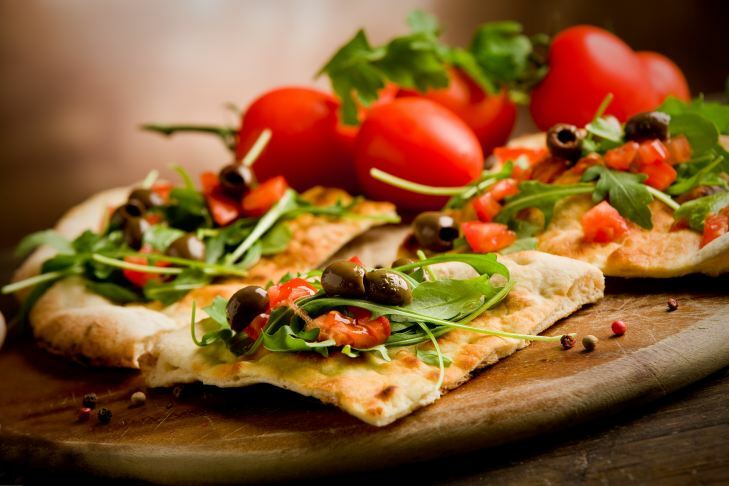 Have you adapted any recipes because of missing ingredients? And how did they come out? Serve with 1/2 lb of spaghetti or egg noodles. I like to also serve with green beans. Why did I start this??? 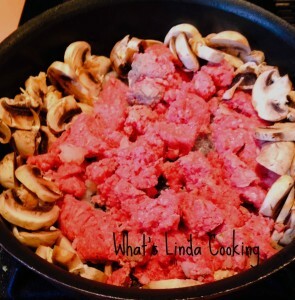 Welcome to my new blog “What’s Linda Cooking”! I am so happy that I finally took the plunge and started writing this blog. I have been thinking about it for a few years but didn’t think I had enough to share. Anyone who knows me, will be laughing at that! From my cooking show, What’s Linda Cooking on ORCTV, book clubs, direct sales business, volunteer gigs…anyone who knows me, knows I have plenty to say and I am rarely at a loss for words. I come from a family of 5 kids…all with a lot to say. I have 2 kids…both with a lot to say. We have always had lively conversation around the dinner table. In fact, our dinners growing up were marathon events. We would sit at the table for hours just discussing what happened during our day or any topic we wanted. Everyone talked over everyone else because we wanted to be heard. To this day, I still have trouble keeping my mouth shut while others talk. I am working on sitting on my hands while others are speaking, so I don’t interrupt. It’s very hard for me! I envision this blog being mostly about food. How I get dinner on the table quickly, deliciously and economically. That’s what I do! I want to help YOU cook more, laugh a lot and enjoy the process of cooking for yourself and your family…whether you have 15 minutes or 2 hours to cook. I will give you shopping, prepping, cooking and general tips to get the shop done fast and in a thrifty way…whether you have $200, $100, $60 or even $40 to spend on groceries. It can be done and it can be done fabulously! A little final information about me. I have a family, a Direct Sales business, and volunteer duties that all keep me very busy. I also have some time consuming hobbies. I hope you come along with me on this blogging adventure. Please drop a comment about you! I would love to hear from you. Your answer to What’s for Dinner and other cooking, home, frugal living questions.